Eat a variety of foods, rather than any one particular food or group of foods. Variety means that we should eat a mixture of foods across the range of food groups and a mixture from within each food group. Eat a varied diet, computed over one week, rather than any one particular food or group of foods. This Web page answers the question: "What is a varied diet?" Good nutrition from eating a healthy diet is the foundation of any wellness program. The Goal is to eat a variety of healthy foods at a total caloric rate that will either maintain or achieve your ideal body weight over a reasonably long period. Nutrition is the relationship of foods to the health of the human body. The foods we consume should provide our bodies with the nutrients necessary for good health. The basic premise of any good diet is variety, balance, and moderation in what we eat, on a regular basis. Good nutrition is obtainable without engaging in dietary extremes. The total intake of nutrients from your diet is associated with total caloric intake. The greater the number of servings that you eat each day, the greater will be your total caloric intake. Thus, the number of servings you should eat from each food group will depend on the number of calories that you are consuming each day. To answer the question: "How varied / healthy is my diet?" Print off the Food Diversity Score Form with your printer. Tick off a one to the right of each food item. Count the number of circles; this is your Food Diversity Score. For each food item, count the number of tick marks. This will identify your Core Foods. Variations may be done, by computing daily and/or food group totals. What does your Food Diversity Score mean? What do your Core Foods mean? Your core foods are the foods that you eat each week with the highest rates of consumption. These foods make up the staples of your present diet. Closely examine each one of them. Are they healthy foods? Are they of the highest quality? To avoid EXCESS consumption of a particular food item, cut back on your core foods. Correspondingly, increase consumption of food items which you consume the least. For food items that you normally serve only half portions of write 1/2 directly in front of the respective food name on the Food Diversity Score form. That way each tick mark would signify one half serving. If you serve only quarter portions, write 1/4 and so on. This way you wont have to keep track of partial servings in your head. 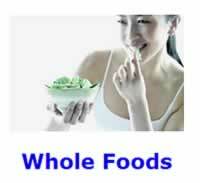 Beginners are allowed to cheat a little bit by selecting process food items like fruit cup, salads, and vegetable soup. Spices are allowable only for those who cook their own foods with added spices, even if you base your meal on a processed food item, like soup or a microwave meal entree. You should record each meal as soon as possible, to avoid memory problems. Can goods and frozen foods provide the number of servings per can and carton in their respective food labels. This is the number of servings that you should be recording on the Food Diversity Score form, if you have consumed the entire container of food within the same week. A food diversity score has predictive power of mortality. A Varied Diet May Help Protect from Colorectal Cancer.